Echinacea is an extremely popular herbal remedy with Native American roots. According to the University of Maryland Medical Center, findings at archaeological sites suggest that some tribes used echinacea as an all-purpose curative for more than four centuries. Echinacea enjoys a reputation as an immune system booster, and it's often suggested as a way to address allergies. However, echinacea is known to cause severe reactions; if you're predisposed to certain allergies, its risks may outweigh its benefits. 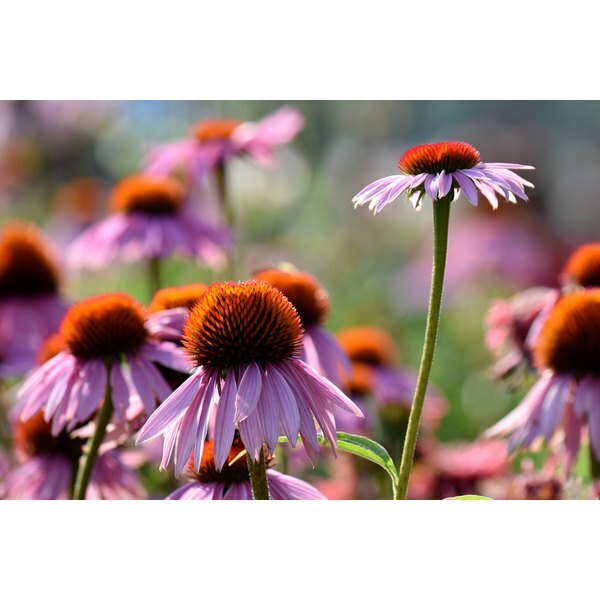 Echinacea goes by many other common names listed by the University of Michigan Health System: black Susan, American cone flower and snakeroot, to name a few. When taken orally, it purportedly stimulates the immune system, which is why herbalists recommend echinacea for hay fever, or allergic rhinitis. More common modern day uses for echinacea include reducing symptoms of colds and the flu, such as cough, fever and sore throat. The Memorial Sloan-Kettering Cancer Center states that test tube and animal studies of echinacea indicate that it can stimulate certain parts of the immune system. However, there have been no clinical trials to see if this is beneficial to humans. According to the Mayo Clinic, there's better scientific research to suggest that echinacea is beneficial for preventing and treating upper respiratory tract infections--more specifically, the common cold--in both children and adults. No clinical studies have examined echinacea as a complementary or alternative therapy specifically for allergies. The National Center for Complementary and Alternative Medicine states that few side effects other than gastrointestinal upset are associated with echinacea. However, some people may experience an allergic reaction–rash, asthma and even anaphylaxis, which is life-threatening. You're more likely to have an allergic reaction to echinacea if you're allergic to plants in the same family: all type of daisies, ragweed, chrysanthemums and marigolds. If you have asthma or atopy, a genetic propensity for allergies, you're also more likely to have an allergic reaction to echinacea. According to the National Institutes of Health, injectible forms of echinacea may cause severe reactions and should be avoided. Echinacea is not suggested for use in children, as it has been associated with increased incidence of rash. The National Institutes of Health also notes that there's no research to suggest that echinacea is safe for pregnant and nursing women. Talk to your doctor before using echinacea for allergies or any other health concern. Echinacea is available in a variety of preparations, including extracts, tinctures, capsules, tablets and ointments. The U.S. Food and Drug Administration treats echinacea products as dietary supplements rather than medications, so no echinacea product is guaranteed to be effective or safe, nor is quality assured. The University of Maryland Medical Center notes that an independent study of echinacea products revealed that only four brands out of 11 actually contained what was stated on the products' labels, and 10 percent of products contained no echinacea at all. Dr. Weil: What's With Echinacea?